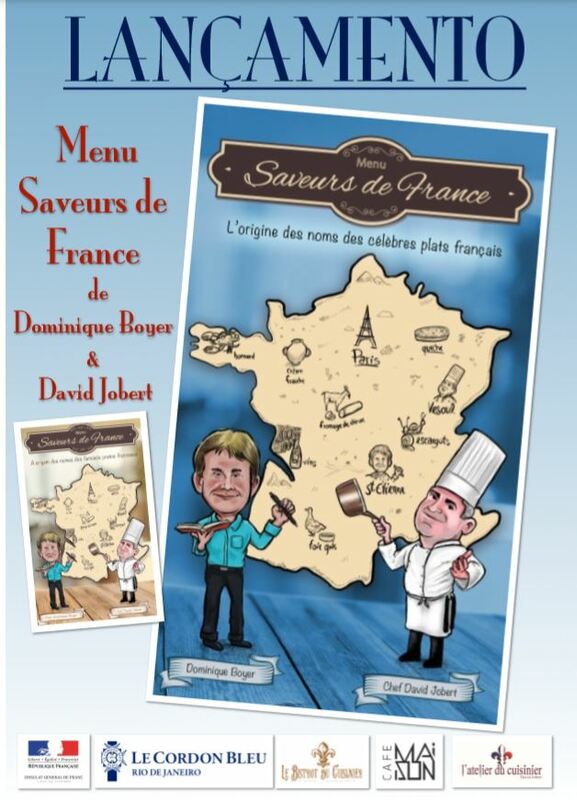 Do not miss the launch of the book "Saveurs de France", authored by the renowned French Chef David Jobert, in partnership with Dominique Boyer, an academic and etymology specialist in Brazil. The event will take place on 01/12/2018, Saturday, between 11:00 and 15:00 at Le Cordon Bleu Institute in Rio de Janeiro. Professor Dominique Boyer, author of other books such as "Gallicisms", launched in 2015, is passionate about French cuisine, and Chef David Jobert, who is hugely successful with his two restaurants in Rio de Janeiro - "L'Atelier du Cuisinier "and" Le Bistrot du Cuisinier "- have united for a common passio: to make us travel through the different French regions, demonstrating that culinary and culture go hand in hand. In addition to the launch of the book, you will also be able to attend a demonstration class with a recipe from the book, so that you can enjoy the experience of studying at Le Cordon Bleu and will be invited to visit the Institute and our facilities!